"A delicious way to celebrate spring and its abundant supply of fresh asparagus. 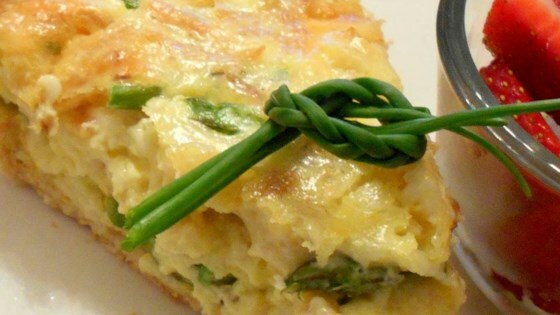 This quiche is a cinch to put together and so very yummy. Enjoy!" Heat olive oil in a skillet over medium heat; cook and stir asparagus until slightly tender, 5 to 10 minutes. Preheat oven to 375 degrees F (190 degrees C). Press pie pastry into a 10-inch deep-dish pie pan. Combine asparagus, eggs, milk, half-and-half, French-fried onions, Swiss cheese, Cheddar cheese, and green onion in a bowl. Pour into prepared pie pastry. Bake in the preheated oven until center of quiche is set and a knife inserted in the middle comes out clean, about 45 minutes. Allow to stand for 10 minutes before serving. See how to make a simple and delicious homemade quiche. An outstanding quiche recipe. Used a frozen deep dish crust and had too much mixture for the pan, so recipe could be reduced 1/4, if desired. Added salt and pepper. Low carb version- omitted crust. Did not miss it at all. Did amply grease the baking dish. Loved the recipe. Easy to make and a wonderful blend of flavors. I didn’t add the French onion rings but it was delicious without them. Made this exactly as printed and it was a great hit with my family, they loved it!